Thank you to everyone (70 people) who came along to a packed SVA on Sunday 11 November for our 17th event 'What makes a Monster & Other Stories'. Special thanks to the ten brilliant authors (see snaps below) whose work we selected and who read/performed so wonderfully. Although, of course, I'd read all the stories before, some of the performances took my breath away. The theme of the spring 2019 event will be INCENDIARY! so we'll be looking for stories about fire, heat, smoke, burning, passion, inflaming, rebellion, revolution, insurrection, bombs, subversion - both literally and metaphorically. We will open for submissions in January or February. The SVA say we have 'outgrown' their venue so our next event will be elsewhere - venue yet to be decided. Some copies of our new 2015-18 Anthology are still available. Info here. If you don't want to miss out on ticket sales or submission opportunities please subscribe to SSS emails. (It's easy to unsubscribe if you change your mind). 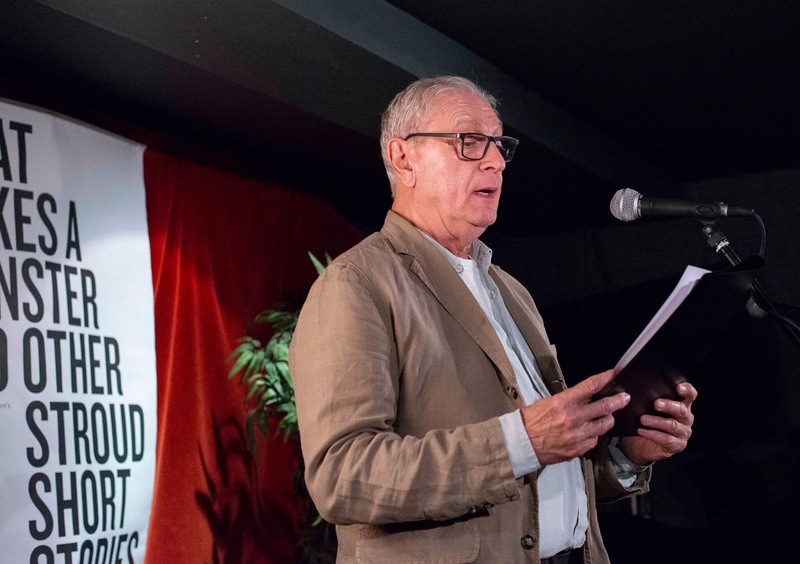 Here are Sunday's ten authors - in the order in which they read/performed. 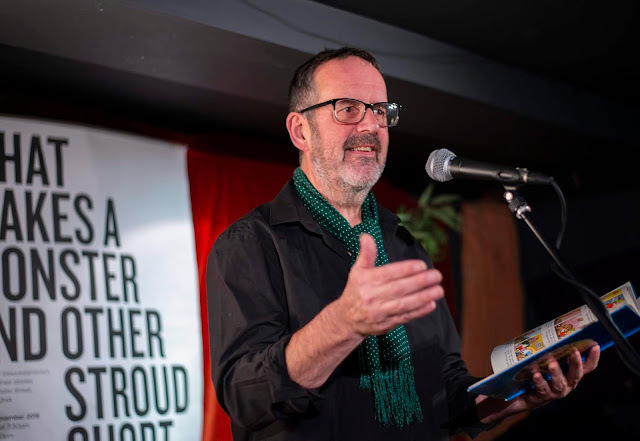 I was delighted to be asked back by SSS organiser John Holland this autumn to co-judge the latest Stroud Short Stories submissions. 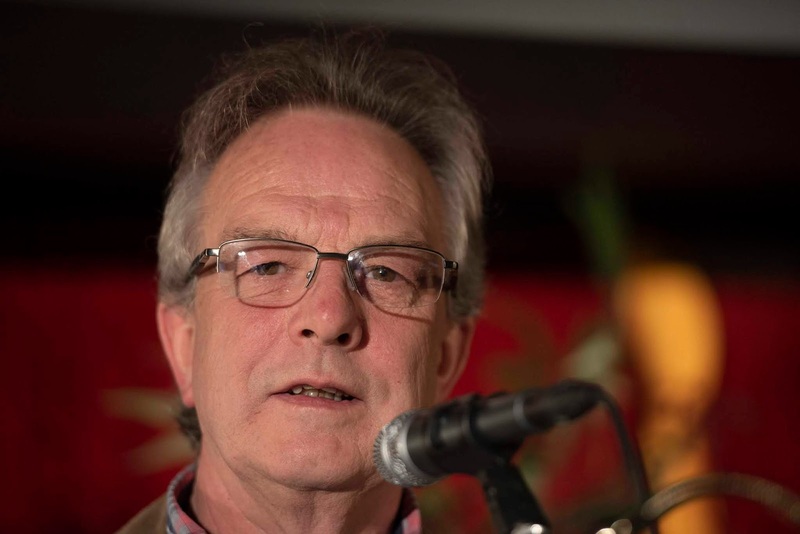 John's well-honed system, underpinned by Christiane Holland's efficiency, makes the process a pleasure, allowing the judges to focus entirely on the stories rather than the admin. 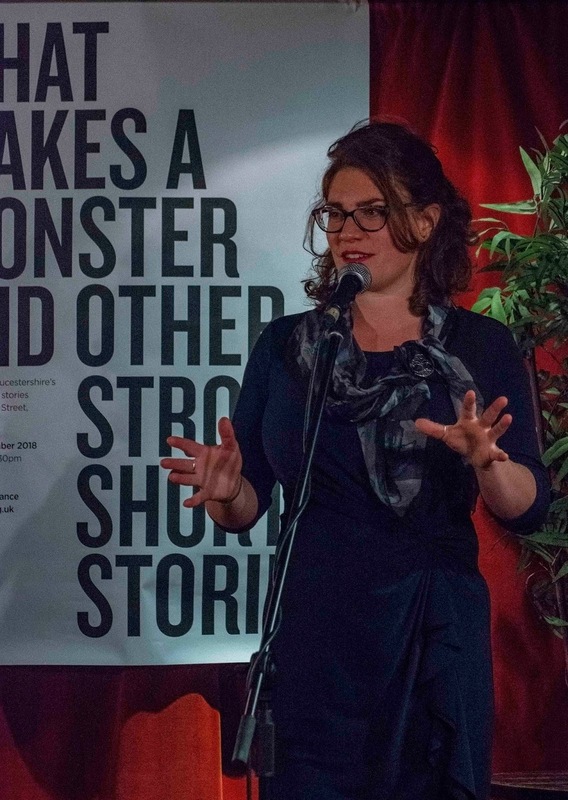 It is exactly how a good short story event or competition should be run. With no set theme this time, it was anyone's guess as to what kind of stories might come in. Tantalising titles whetted my appetite to the unfolding array. 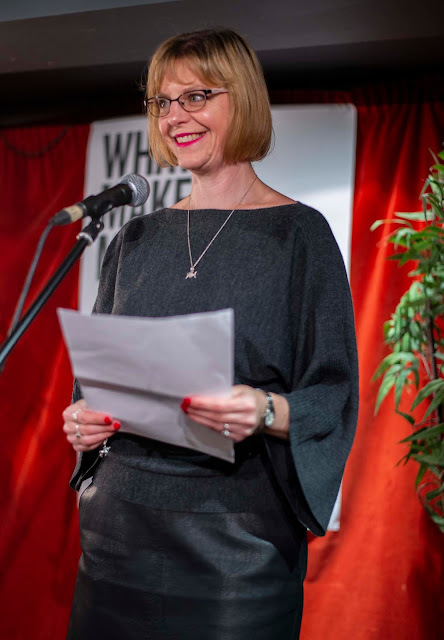 When we opened the envelope containing the names of the authors, after choosing our Final Ten, there were plenty of surprises, including the appearance of a number of names new to SSS. That respected authors whose stories had previously been chosen did not make the final cut demonstrates the high standard of the submissions. I'm always pleased when we select entries from writers still learning their craft. 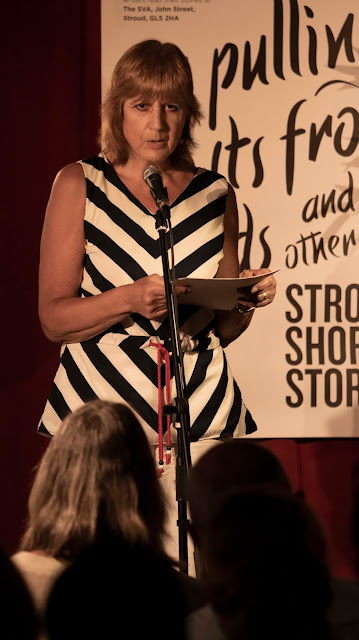 That SSS welcomes all-comers (and is free to enter) is part of its charm - and part of its power in nurturing local writing talent. I particularly like the fact that SSS does not rely on the opinion of one judge, as having two results in more balanced decisions. If either John or I - or anyone else - had been sole judge, the final list may have looked quite different. So if you submitted but your story wasn't chosen, keep going - because at the end of the day what matters most is that you keep writing, that you keep refining your craft and keep putting your best stories out into the world. Thank you to everyone who submitted stories for our 17th event on 11 November. 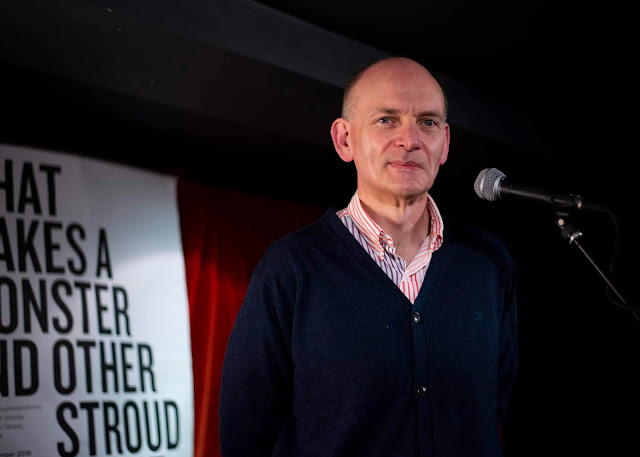 The total of 112 submissions from 85 Gloucestershire and South Gloucestershire writers is the third highest in our history. Believe me, my co-judge, Debbie Young, and I had our work cut out. We really enjoyed the vast majority of the stories, and produced a Long List of 40 and a Short List of 18 before deciding on the Final Ten. All these lists have already been shared with the writers who submitted. The competition was incredibly intense and the decisions did not come easily. In the end, the Ten we have chosen are possibly, in terms of contents/story lines, the most diverse range of SSS stories ever. Huge congratulations to these authors. 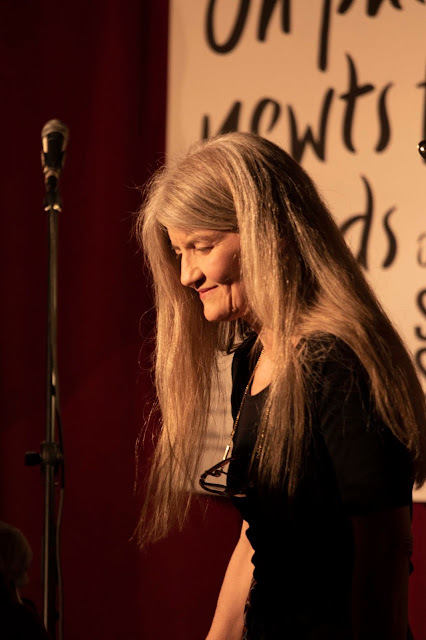 They will read their stories to what will be a packed house at the SVA (Stroud Valleys Artspace) on Sunday 11 November at 8pm (doors 7.30). As always, the Ten includes authors new to SSS. This time there will be five! We welcome and congratulate Zara, Katie, Clive, Amanda and Sophie. Only two of the ten authors (Ali and Andrew) have read at SSS on more than one occasion. 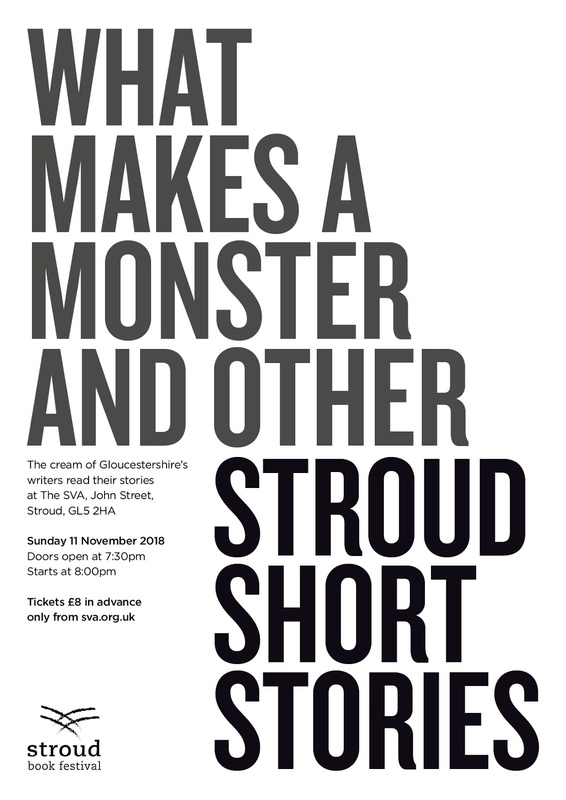 The event is now called 'What Makes A Monster And Other Stroud Short Stories'. The event is on Sunday 11 November at 8pm (doors at 7.30) at the SVA (Stroud Valleys Artspace), John Street, Stroud, GL5 2HA. There is a bar. This event is part of the Stroud Book Festival. It will also be our last event at the SVA. Please note that some of the early tickets sold by the SVA say the event starts at 7.30. This is WRONG. In fact it starts at 8.00. Tickets always sell out in advance. Do not tarry. PLEASE NOTE - SSS does not sell tickets. All ticket enquiries to the SVA. Thank you again to everyone who submitted stories. 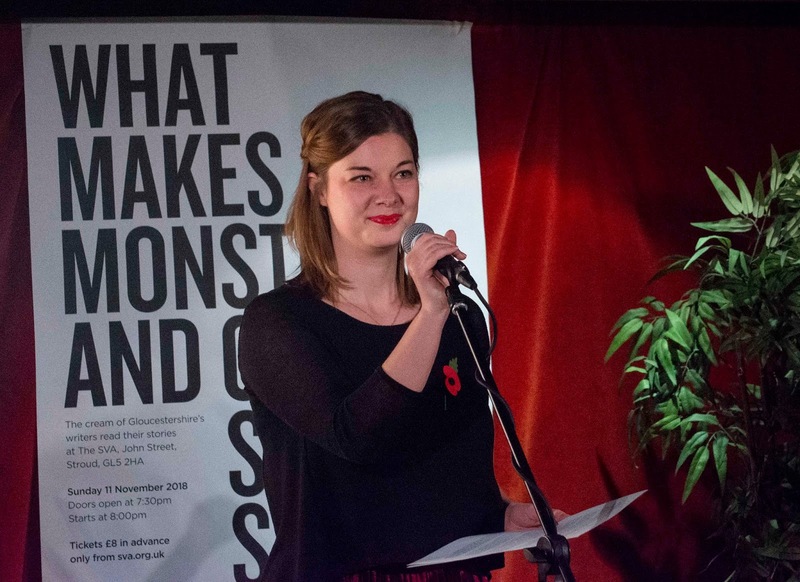 A HUGE thank you to everyone who submitted a story or two for our 11 November event. Submissions have now closed. 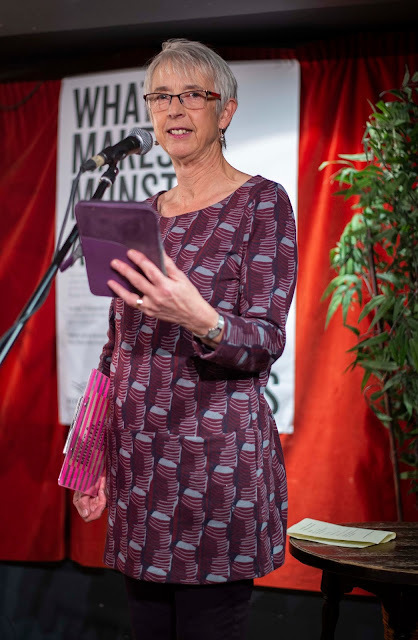 85 writers from Gloucs and South Gloucs submitted a total of 112 stories. That's the third highest number in our seven year history. Brilliant response. Thank you again. We will publish the names of the ten authors and stories we have chosen as soon as possible. Tickets (available only in advance) are £8.00 - including the SVA booking charge. Our last eleven events have all sold out in advance, the last one in just 5 days, so best not to tarry. Please note that SSS does not sell the tickets. All ticket enquiries to the SVA please. The event starts at 8.00pm (doors 7.30) and ends around 10.15. There is a bar. 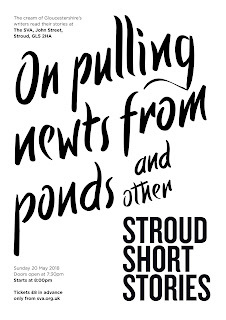 You can buy the brand new Stroud Short Stories Anthology Volume Two 2015-2108 from local bookshops and from Amazon. 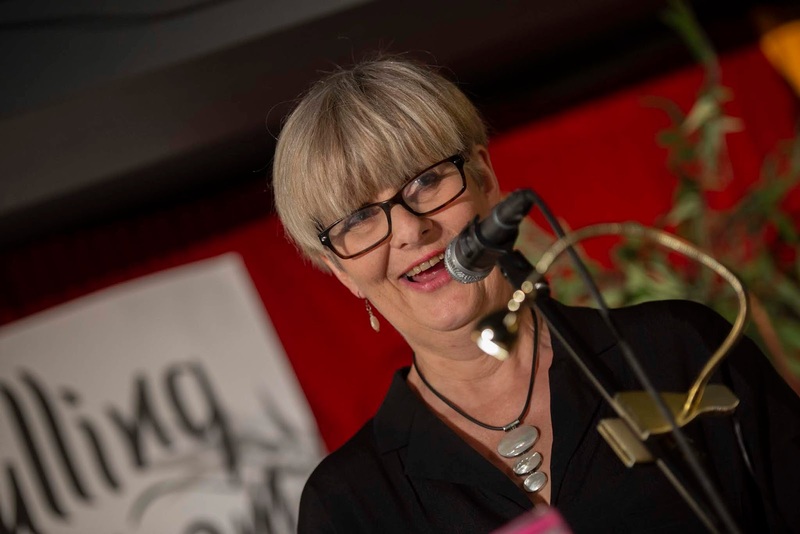 The anthology has 57 stories by 45 Gloucestershire authors from the six SSS events which took place from November 2015 to May 2018. 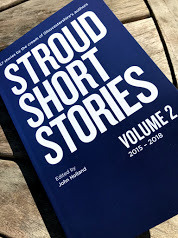 I have edited it and Stroud Short Stories has published it. The paperback is priced at £10. 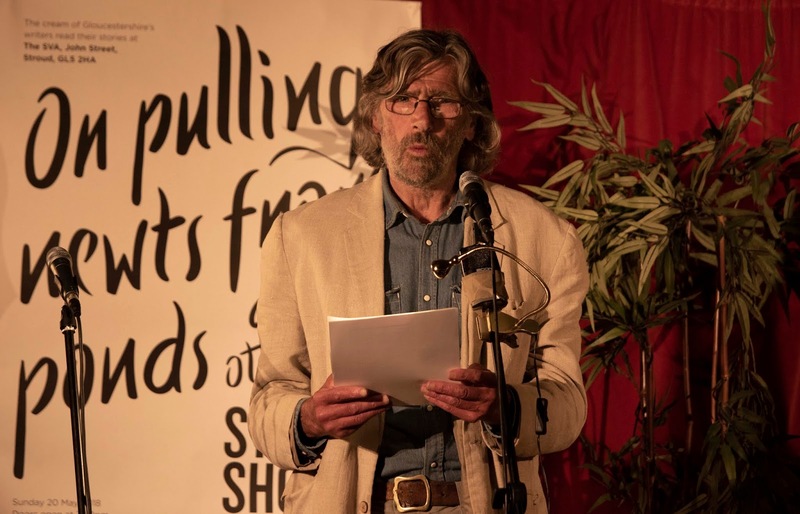 Local stockists are The Stroud Bookshop, Trading Post in Stroud, The Yellow-Lighted Bookshop in Nailsworth and The Suffolk Anthology Bookshop in Cheltenham. It's available from Amazon in paperback (£10) and eBook (£2.99) formats. More information about the authors in the anthology and the stockists is here. If anyone fancies providing a book review for the Amazon page that would be really helpful. You don't need to have bought your copy via Amazon to do this. Thank you. We want your stories! We are now open for your submissions to our next event on Sunday 11 November 2018. We are now open for submissions to our 17th event - to be held on Sunday 11 November 2018. We close at the end of Sunday 14 October. We interrupt our normal promotion of our events to congratulate Stroud Short Stories Organiser John Holland on winning the Dorset Fiction Award - an award for short stories with fewer than one thousand words. 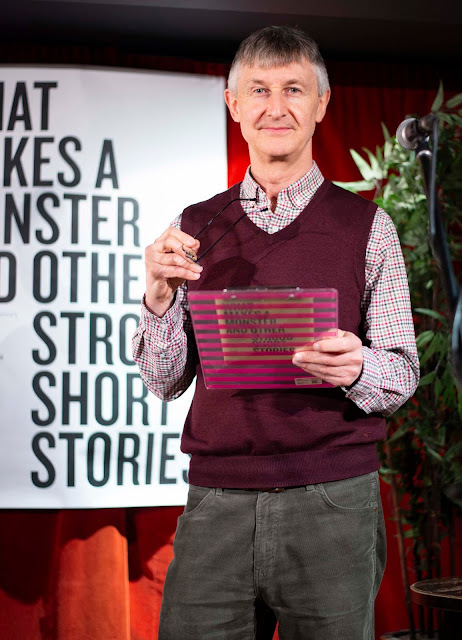 John's story 'Cows' - about two people in a car surrounded by a herd of cows - has won him First Prize, £500, and both online and print publication. 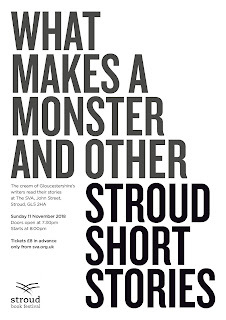 PS The next Stroud Short Stories event is on 11 November 2018. It will be an open theme. We will open for submissions at the beginning of September. I was pretty surprised last November when our venue, the SVA, sold all tickets for the SSS event in SIX DAYS. The May event has just SOLD OUT in FIVE DAYS! Thank you to everyone who has bought tickets. Our authors will be reading to an audience of 70 people. 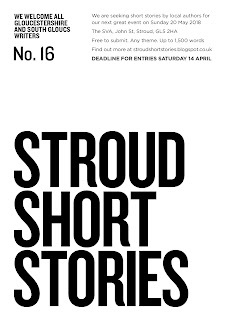 'Now that I've been co-judge of Stroud Short Stories for a second time, I can only say it doesn't get any easier! In fact, it seemed more difficult this time to pick out ten. There are always one or two personal favourites, but after these there were so many well-written and engaging stories of what seemed like equal merit that we struggled to come to our decision - hence the first ever SSS 'long-list'. 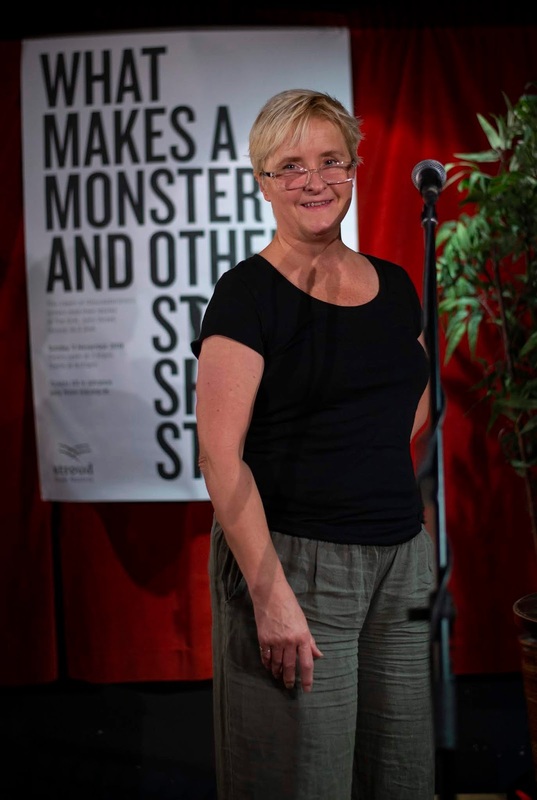 In terms of theme, although those short story favourites (love, loss, death, relationships and family) did make an appearance, they were by and large treated in an original way or with striking use of language or style. There was also a very liberal sprinkling of off-beat and up-beat stories, and enough humour - from gentle to black - to save us from wallowing in too much emotion. I'm pleased to say that several such stories make an appearance in the final line-up. There were some stories which didn't quite 'deliver' in the indefinable way a short story should, and some more than a few had an ending we agreed didn't live up to the rest. Unusually we also found the opposite - good endings with less convincing starts! All of these are reminders of how difficult it is to write a really successful short story, especially one for performance, and how an apparently very small thing (like the last line) can make a huge difference. The list of the ten authors who will read their stories on 20 May is below. 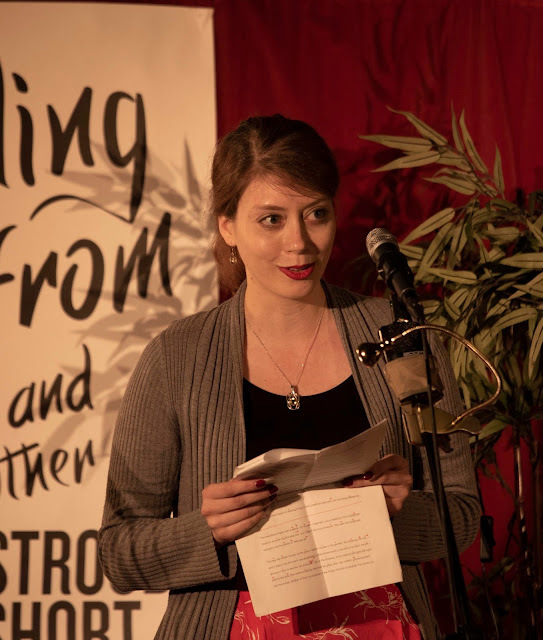 Thank you to everyone who submitted stories for our 16th event on 20 May. 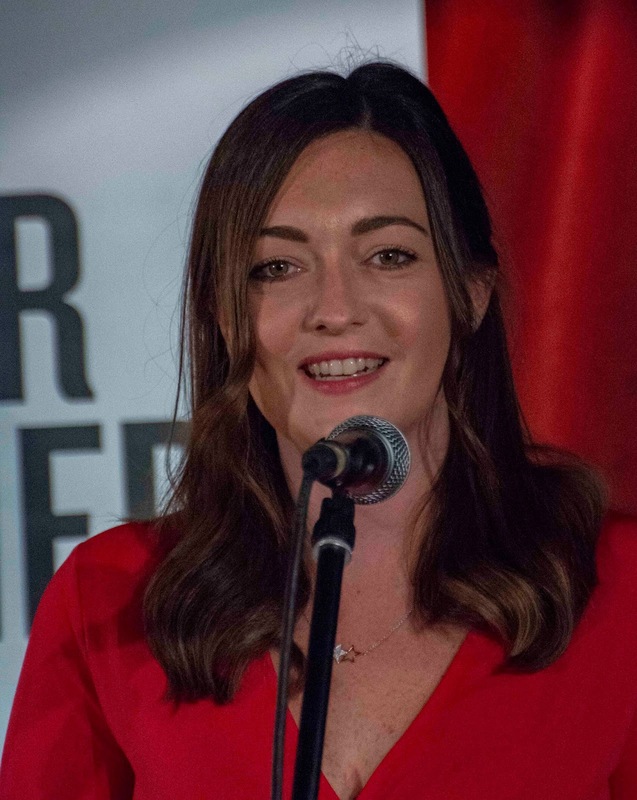 With a record-equalling total of 128 submissions from 87 writers, my co-judge, Ali Bacon, and I had our work cut out. We enjoyed very many of the stories, and seriously considered about fifty excellent tales for the final ten. All writers who submitted have been informed of our decisions, so I can now share the news here on the website. These are truly brilliant stories. Huge congratulations to these authors in such a competitive field. 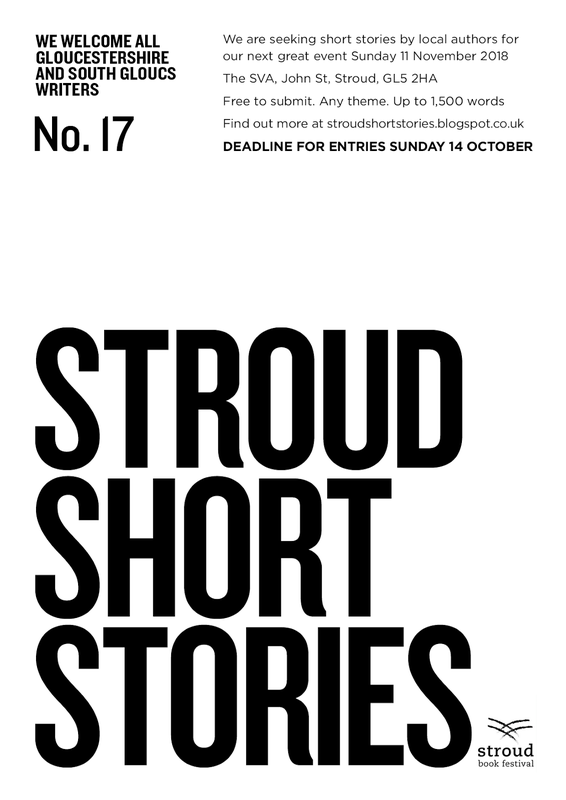 They will be offered publication of their stories in the new Stroud Short Stories Anthology 2015-18 due out this summer. 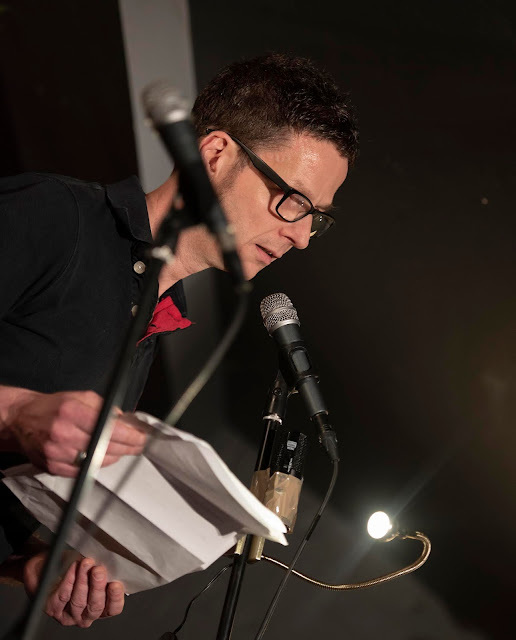 And of course they will read these stories to what will be a packed house at the SVA (Stroud Valleys Artspace) on Sunday 20 May at 8pm (doors 7.30). As always the Ten includes authors new to SSS. This time there will be four. We welcome and congratulate James, Nick, Sarah and Val. 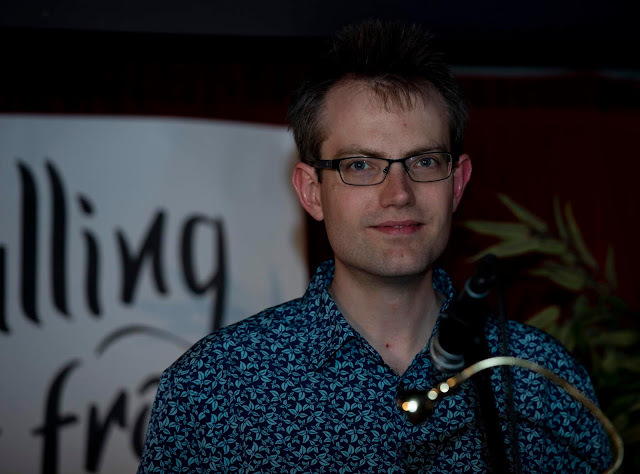 Excitingly, one will be the 100th author to read at a SSS event. 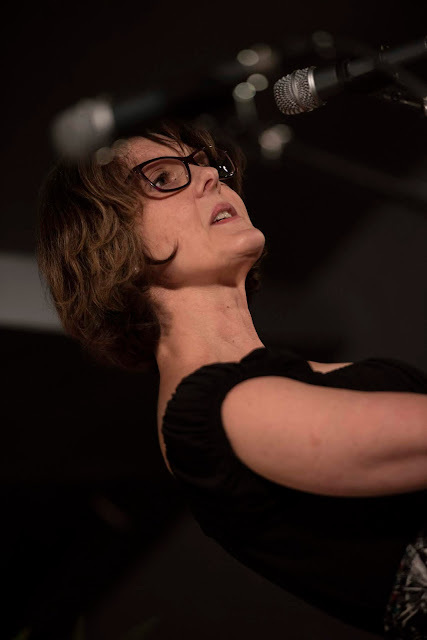 The event is on Sunday 20 May at 8pm (doors at 7.30) at the SVA (Stroud Valleys Artspace), John Street, Stroud, GL5 2HA. There is a bar. 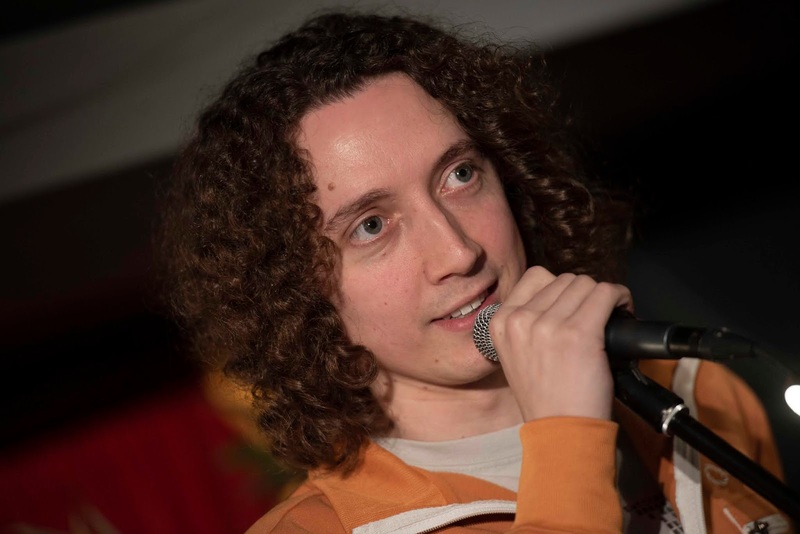 Tickets, priced at £8 (including the SVA's booking fee), are on sale from the SVA website. Click on 'Tickets', then the word 'advance' on the SSS advert. Then bob's your haircut. They always sell out in advance. Last November, tickets sold out in just six days. Do not tarry. 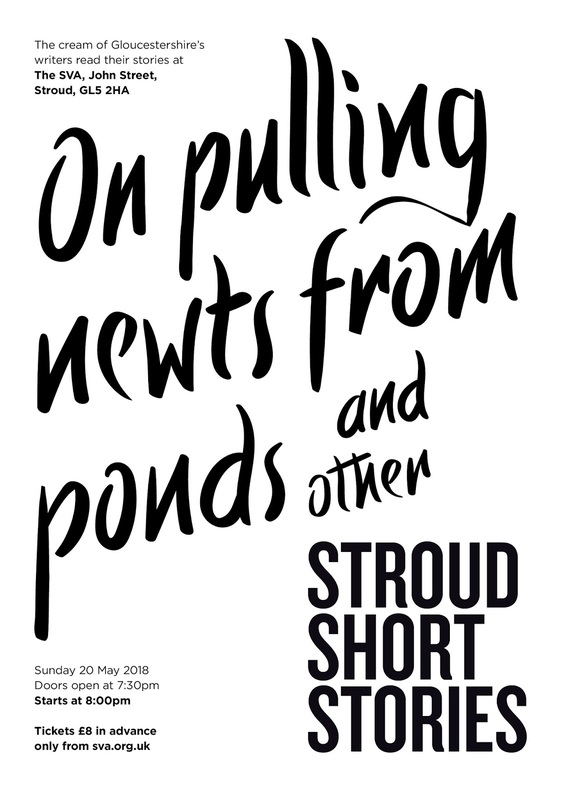 Please note that Stroud Short Stories does not sell the tickets. Thank you so much for sending us your stories. We have a bumper crop of 128 stories to read, a figure which equals our record for submissions set in March 2015. The 128 stories represent the work of 87 writers. We will let all writers who have sent us stories know the ten we have chosen by 4 May at the very latest. Earlier if we can. The judges are hard at work. Tickets for the 20 May event will only be available from the website of our venue, the SVA (Stroud Valleys Artspace) in John Street, Stroud in advance of the event. I will try to let you know when they go on sale, but it's worth you checking the SVA's website regularly. The SVA always sells out our event. Our last one sold out in 6 days. We are open for your submissions until Saturday 14 April 2018 at 23.59 - and we still want your stories! We are still open for submissions for our 20 May event, but we close at the end of Saturday 14 April - at one minute to midnight. There is no theme for this, our 16th event. So any style, any genre or no genre. As ever it's free to submit and we accept both published and unpublished stories from Gloucestershire and South Gloucs writers. Ten authors will read their work in front of a capacity audience of 70 short story lovers at 8pm on Sunday 20 May at the SVA in John Street, Stroud, GL5 2HA. For the Rules and How to Submit to the May event click on the tab above or here. We will be publishing a second anthology later this year and all ten authors will be invited to have their stories published in it. 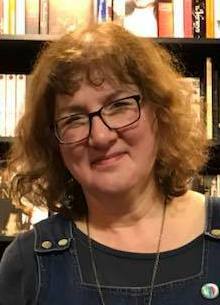 I am delighted to have inveigled the brilliant author Ali Bacon to judge with me for the second time. Check out more info about the judges using the tab above or here. Can May's event possibly be as good as last November's? That's really up to you, isn't it? There's still lots of time to write something for us. Or you may try us with one of your favourite published stories. If you want an idea of what we like (and we do like lots of different styles) listen to six of the November stories here. 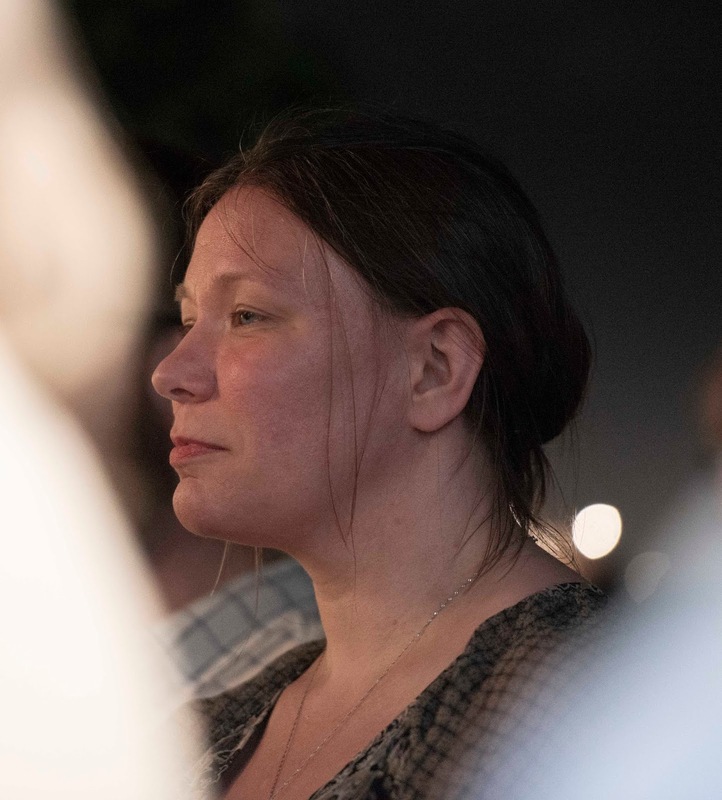 But remember it's a live lit event, so complex multi-dimensional stories and stories with many voices and lots of dialogue are not best suited to the event. What do you have to lose by submitting? As Edwin Starr once said, "Absolutely nothing!"